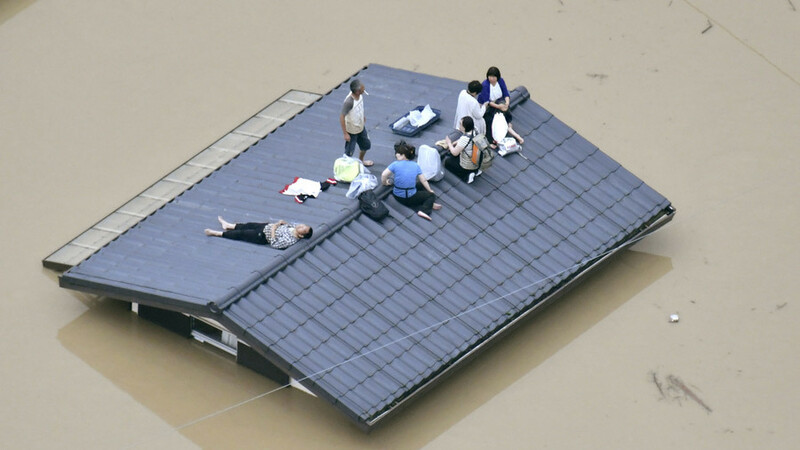 Record-breaking torrential rains struck western Japan, causing at least 44 deaths and leaving dozens injured. The authorities have ordered mass evacuations in the affected areas. The heavy flooding destroyed roads and houses, forcing residents to seek refuge on the rooftops of buildings. Local media have reported various numbers of casualties, with the NHK public broadcaster stating on Saturday that the death toll had risen to 44. At least 10 people are believed to have been buried alive by mudslides in Hiroshima Prefecture, according to Kyodo News. According to NHK, 50 people are so far reported to be missing, and dozens are injured, with five remaining in critical condition. The government issued an evacuation order for around 164,000 people on Friday in the western region of Kansai alone, Japanese media report. Another 860,000 residents received an evacuation advisory. The nation’s Meteorological Agency lifted the emergency warnings in Hiroshima Prefecture on Saturday, while the state of emergency is still in effect in Okayama, Tottori, Hyogo and Kyoto prefectures.